Jennifer Goodman is certain, as executive director of the NH Preservation Alliance, that she has one of the best jobs around – she spends her days "working with great people and special places, and trying to sustain and improve communities today and for the future." Growing up in a family committed to education, the environment and the arts, she says she developed a love of exploring what makes great places to live, and how history connects to what we think and do today. During her tenure at the Preservation Alliance, the organization has gone from assisting a few dozen projects to more than 100 a year. For that and other contributions to the state, the Alliance received the 2012 Champion in Action award from WMUR and Citizens Bank. Ahead, Goodman says the biggest challenge will be answering the growing number of calls for help, help not available anywhere else. Another challenge – what she calls the "always-renewing to-do list" to maintain the 1897 Concord home that she and her family live in. She says, "We use the Alliance's window, painting, weatherization and other tips to keep on top of the list." Maybe it's obvious, but why should we preserve old buildings? It connects our past with our future, and historic preservation is good for New Hampshire's economy. Investment in old buildings has helped incubate new businesses, generate jobs and new tax revenues, attract young people or visitors, and had a catalytic effect encouraging even more investment. Historic preservation is also an ultimate form of recycling – maintaining and re-using old buildings is a sound use of energy. 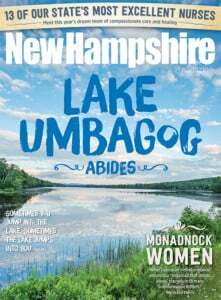 And there are, of course, iconic buildings and historic communities that really define New Hampshire. It's easy to understand how buildings can be preserved, but how do you preserve landscapes? Preservation and conservation easements, planning mechanisms and incentives can help property owners and community leaders who want to preserve old farms, scenic roads or other landscapes they enjoy as well as the look and vitality of neighborhoods, village centers and downtowns. Your website says lessons can be learned from "Downton Abbey." What lessons? The Crawley family's struggle to save their estate offers us an excuse to remind people with properties that can feel overwhelming – such as a big church with a small congregation, a summer home with high property taxes or an under-utilized mill building – that the Preservation Alliance can help you consider creative strategies that meet your preservation and financial goals. You say preservation contributes to the state's economic viability and environmental sustainability. How? Labor-intensive preservation work supports and creates good jobs. Our landmark properties, scenic landscapes and vibrant downtowns attract visitors, and heritage visitors stay longer and spend more than other types of visitors. Preservation activity encourages investment in existing infrastructure that saves energy and helps protect open space, farm land and forest land. How is the organization a resource for communities and individuals? Our staff and colleagues provide coaching, information and referrals as well as planning grants, workshops and much more. We help about 100 community projects, and reach thousands of homeowners each year – with mentoring sessions for advocates for community landmarks; information on barns, weatherization, lead paint and old windows; and behind-the-scenes tours for enjoying special places.